So yes, I realize that Sylvia Plath killed herself by sticking her head in her oven. I realize that she was an amazingly talented person who had some very deep, troubling issues (as in she isn't the best to look to for life advice), I get it, but I also feel that some of the things she said describe me better than any other quote I've ever heard/read before, and I'm always going to appreciate that. When I was in high school, I read The Bell Jar because it was on my AP reading list and it was the kind of book that is so well loved the pages smell like an old library and the cover feels silky smooth. I knew right when I picked it up that I was going to love it and it didn't disappoint. I'll just throw it out there that yes, it can move a bit slow and lead you to wonder "Where is this going?" and yes, it can be a bit (actually quite a lot) depressing, but in the end, once you've sat and thought about it a bit and really put it into perspective, you'll come to love it, I promise. I often say it's the girl version of Catcher in the Rye as Esther is just lost, unhappy, and very depressed…reminiscent to me of Holden Caulfield. 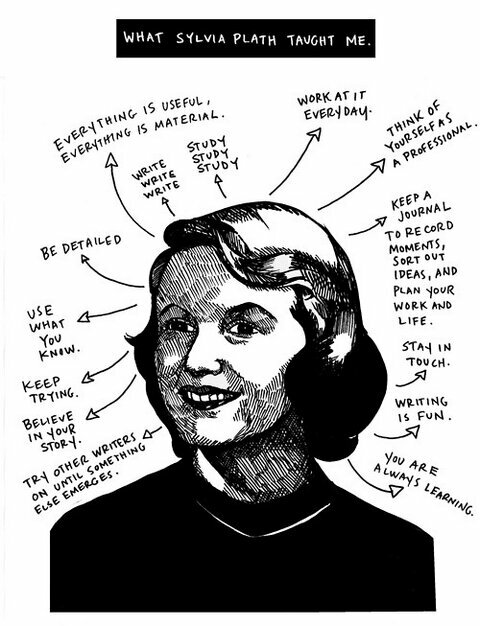 Back to the main reason I've written these posts - Sylvia Plath quotes. I stumbled across a few on tumblr and then just kept searching for more. I absolutely love them. She said and wrote such relatable things that are so simple but feel so profound. I think she said things that at the time, and still now today, people are afraid to admit and say out loud, and I love her for it. I do not think this could describe my current state any better. It drives me nuts all the places I will never see and experience, all the books I'll never read and all the cool facts I'll never know. The people I can never be is the breaking point for me though. People always tell you that you can be anything you want, but sometimes, that just isn't true. And then there comes times when I want to be so many things and can't possible be (an archaeologist, marine biologist, world traveler/hippie, and political strategist) all at once. I guess it's just a fact of life, but it really, really, bothers me. “What horrifies me most is the idea of being useless: well-educated, brilliantly promising, and fading out into an indifferent middle age.” This is an ever present fear of mine that I could never put into words before this. I am so afraid of being so smart and good at something and having so much promise and never becoming anyone or making any difference. More than anything else, I don't want to be indifferent or unimportant. “Why can’t I try on different lives, like dresses, to see which one fits me and is most becoming?” I think at some point everyone has felt like this. Why can't we just know how our life will turn out if we make one decision as opposed to another? Why can't we just know that we'll be happy and not regret choosing something else at the very moment we're at now? “Please don’t expect me to always be good and kind and loving. There are times when I will be cold and thoughtless and hard to understand.” This is me. 100%, I could not have summed it up better, absolutely love it. My family picks a lot because I am very weird about emotional things and don't really like physical affection, but really, I just have days where it works for me and some where it doesn't. Sometimes, I am the kindest person who will go out of her way for even the strangest of strangers, and sometimes I am cold for no apparent reason and I can do things that hurt people without even real trying and I don't even understand it myself. We are taught that as women we must always be rays of sunshine who are always gracious and kind and loving and so sweet, but sometimes I'm just not. And it's not a sin or a defining characteristic of my personality, it is just a part of me that is what it is, and it's okay. I confess that I've never heard of Slyvia Path but these quotes definitely resonate with me - I will definitely be adding some of her works to my 'to-read' list! Yes, you totally should! A bit depressing, but very truthful and real! I absolutely adore Sylvia Plath! Let's add that to the ridiculously long list of things that make us basically the same person! We were separated at birth, I'm sure of it! Getting to know Sarah Smile Pt. 2! "Why do you love England so much?" New Year's Resolutions…and all that jazz.